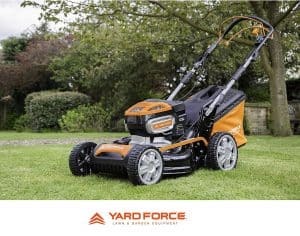 The Yard Force 46cm Cordless Rotary Lawnmower is a self propelled 108 volt battery that gives around 55 minutes of run-time and is suitable for lawns up to 1000m². The height adjustment on the Yard Force 108V Li can be set between 25mm and 75mm and comes supplied with a large 55 litre grass box. 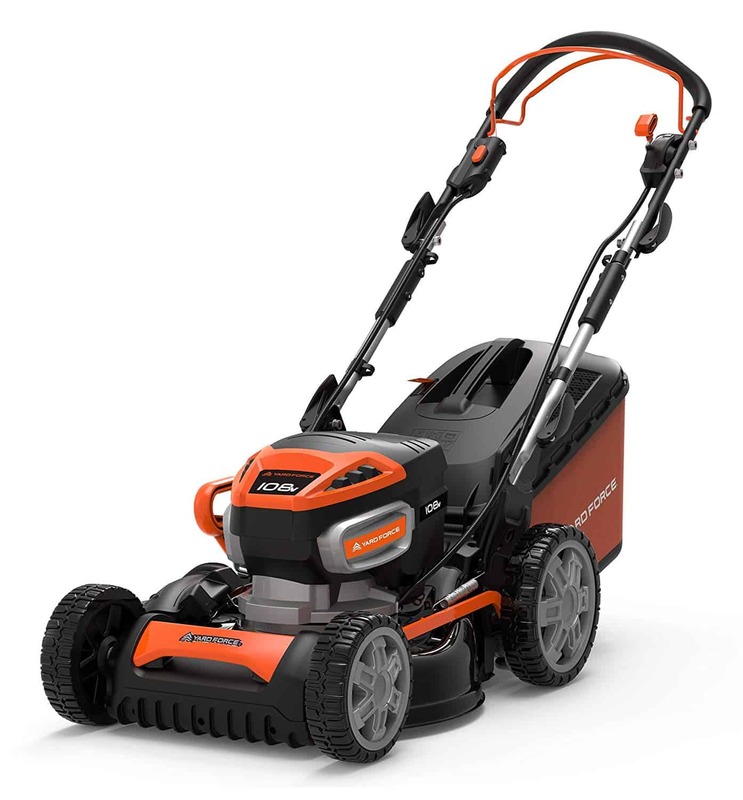 The Yard Force 46cm Cordless Rotary Lawnmower has 4 different cutting modes including bagging, mulching, side discharge and rear discharge and a 46cm cutting width. 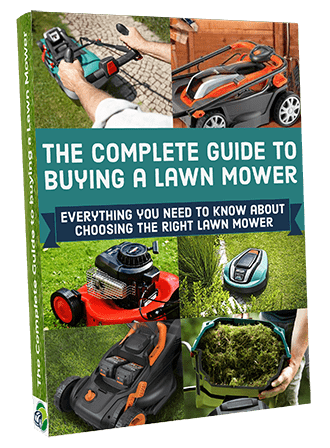 Most people think of cordless lawn mowers as basic equipment for a small to medium garden. Many are not up to tougher challenges such as long or wet grass. Not so with the super powerful 46cm High Power 108V Li-ion Yard Force Cordless Lawnmower. This strong machine will give you all the freedom and power of a petrol lawn mower without any of the hassles. 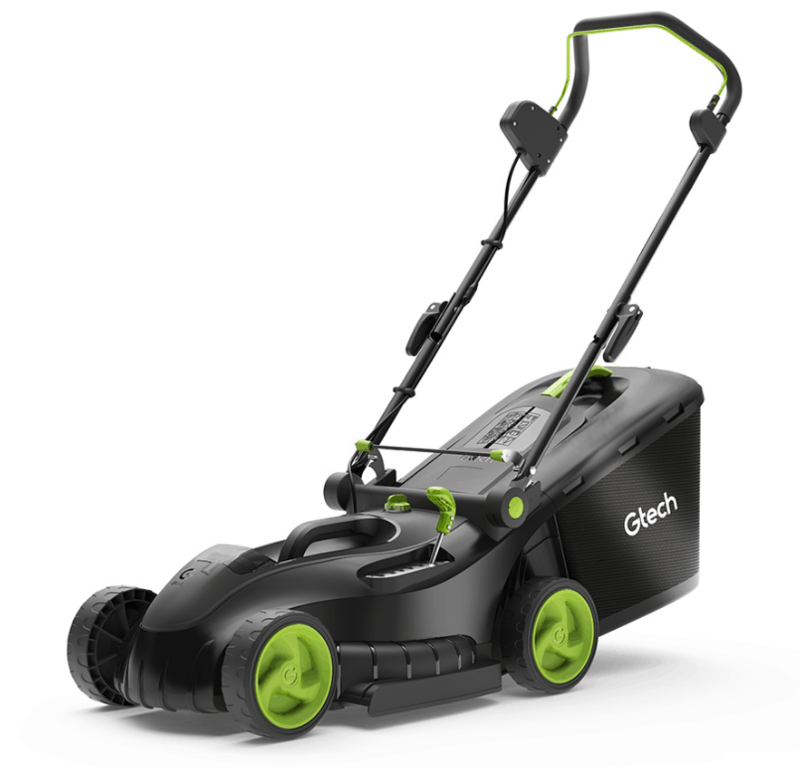 The large deck and blade size and quality batteries on this Yard Force 46cm Cordless Rotary Lawnmower will allow you to cut lawns as large as 1000sqm. That is a great advantage. Coupled with this it has a large grass bag so you can really get through your lawn with minimal time and effort. Not only does it have great power and a very good run time, but it also has all the features you would expect from a top of the range lawn mower. 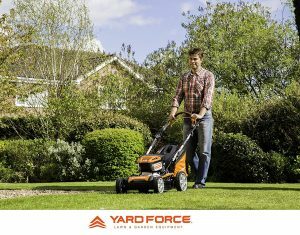 If you want a cordless option that can handle slightly larger gardens than the Yard Force Cordless Lawnmower 108V is a real winner. The battery is a top quality Samsung Lithium-Ion 2.5Ah so that gives it an extra edge. Another great advantage is that the motor is brushless. This makes it a lot more efficient. 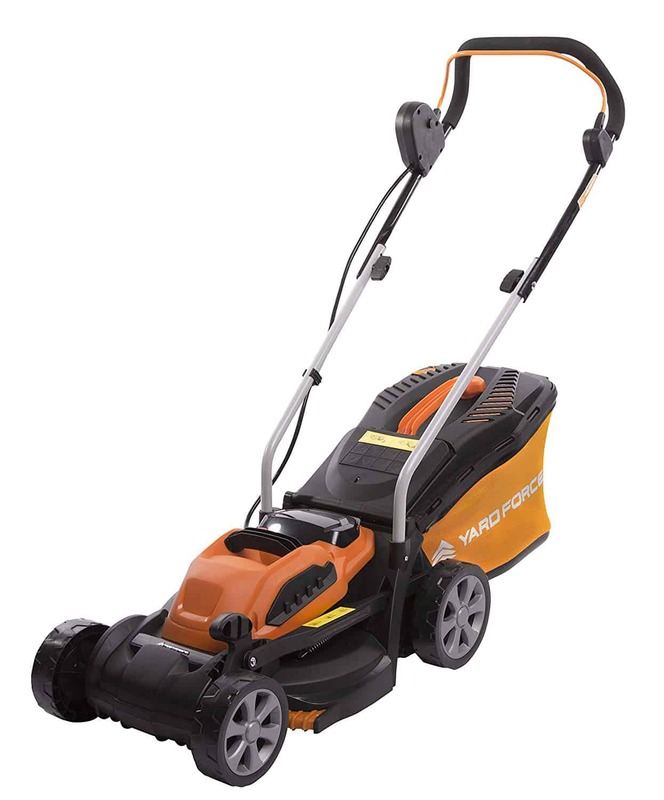 It has all the power and stamina you need and will handle lawns up to 1000sqm. This is impressive for a cordless lawn power and way higher than average. 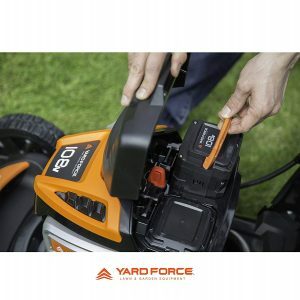 Yard Force use their propriety Torque-Sense Technology giving the machine additional power to handle even the toughest conditions. Although heavier than average it is self-propelled so pushing it is a breeze. Long grass, damp or tough grass is no match for this beast. 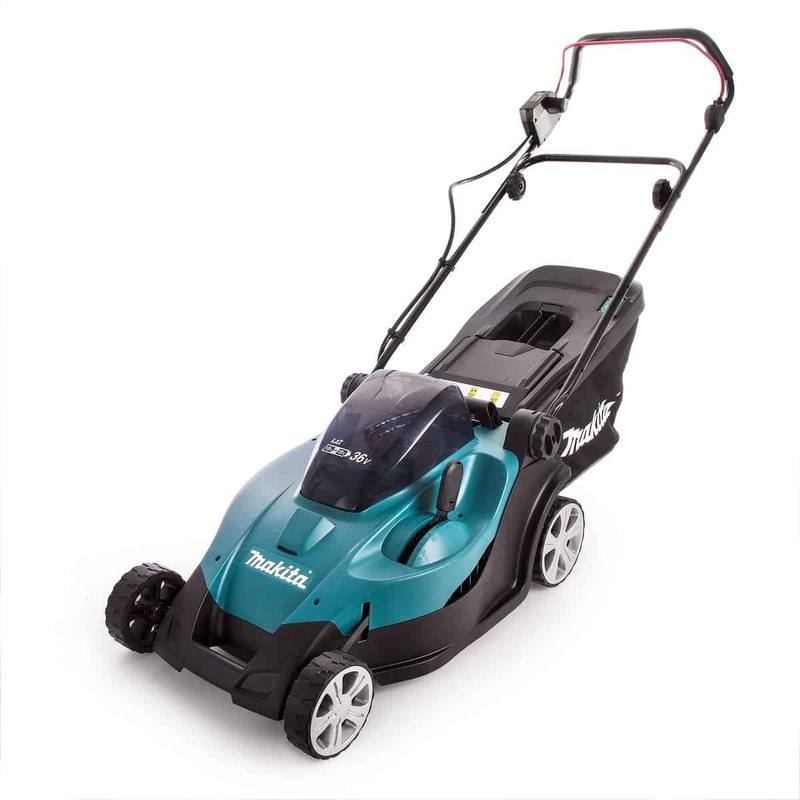 This Yard Force 46cm Cordless Rotary Lawnmower truly is a competitor to a petrol mower with all the advantages of a cordless mower in terms of power, quietness, maintenance and being more environmentally friendly, wow! good job Yard Force! The lawn mower comes with clear and well-written instructions and assembly is not that tricky. Due to all the additional features this model has it will probably take slightly longer than an entry level lawn mower but it is not challenging and the instructions are clear. 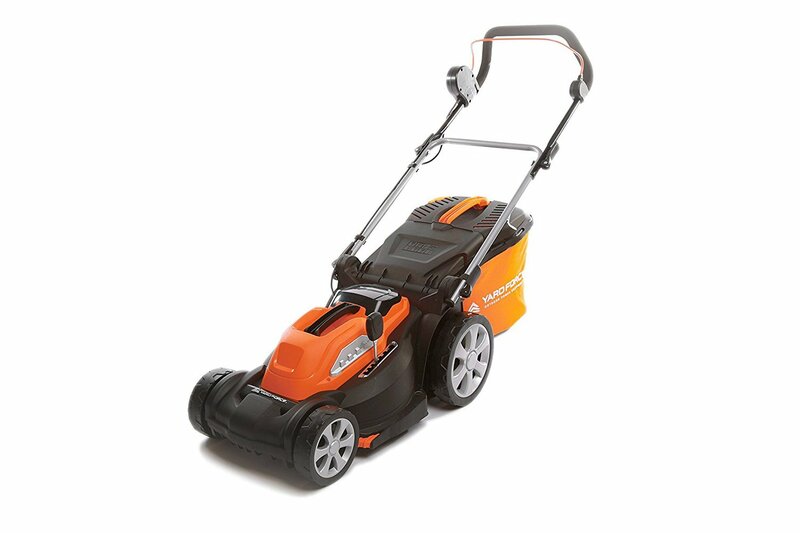 One of the many features that make this a fast and powerful lawnmower is the large 46cm cutting width it offers. Again, this is exceptional on a cordless lawn mower and will make cutting grass, even larger lawns, fast and efficient. The Steel OptiBlade is another Yard Force propriety design and it is sharp for perfect mowing. The grass comb is included and makes it more precise and accurate. Despite the size, it will cut edges and curves efficiently. 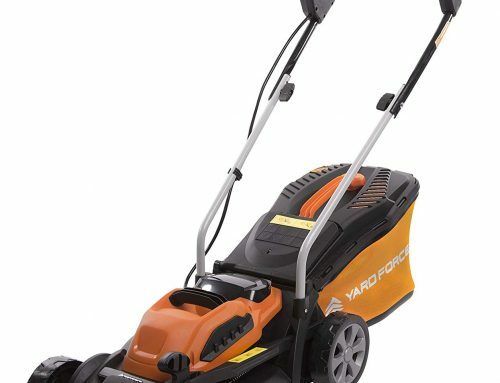 The Yard Force 46cm Cordless Rotary Lawnmower model uses central height adjustment making it quick and easy to change. You have a good range 7 heights to choose from and the options are from 25mm to 75mm. That is all you need to attain the perfect height according to your requirements and the season. It is important to adjust the cutting height from time to time and this Yard Force model makes it super easy. This will help keep your lawn in pristine condition all year round. This is a heavy powerful mower yet the height adjustment is very easy with a large central handle that you can get your whole hand around. 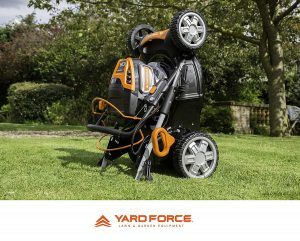 With some larger mowers you need to struggle and fight with the height adjustment, with this Yard Force 46cm Cordless Rotary Lawnmower that’s not the case, again, a nice touch touch from Yard Force. As previously mentioned, one of the outstanding features of this model is the large deck size and the 46cm cutting diameter. What this means, especially on larger lawns, is less time and effort. You will need fewer passes to cut the grass evenly as compared to lawn mowers with a smaller cutting width. What makes this even better is it has the power and technology to handle the larger than average cutting diameter so your work will need minimal effort. Remember a 46cm deck size is large and going to take up more storage space. 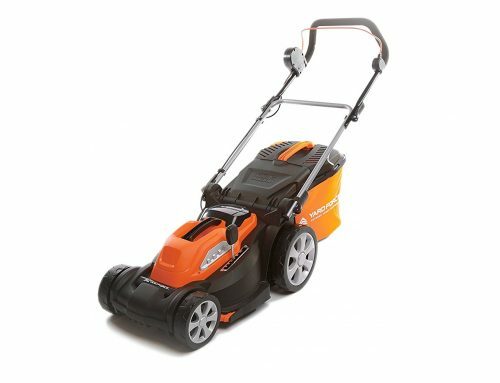 With this Yard Force 46cm Cordless Rotary Lawnmower you have the ability to mow and stow, meaning the mower can be folded down and tipped on it’s back, a great space saving feature. This is a truly feature rich lawn mower and Yard Force did not leave out the rear roller. While it might not be for everybody if you want that classical striped effect on your lawn this model will do it for you. Think of top sport fields or Wimbledon, you can achieve that perfect look with ease. 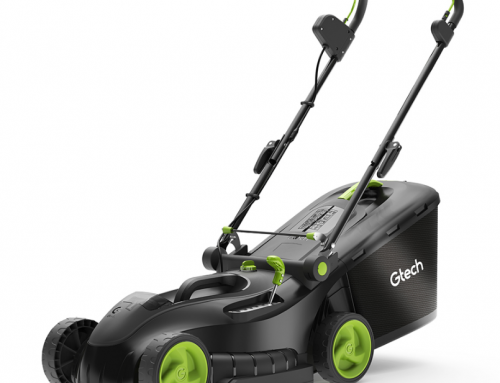 This is particularly appealing on larger lawns which this mower is designed for. An additional benefit of the rear roller is that it gives the machine greater stability so it helps when you are cutting on tight bends or uneven ground. It is a great feature to have for when you want it. With minimal effort, your lawn can become the envy of everyone in the neighbourhood. 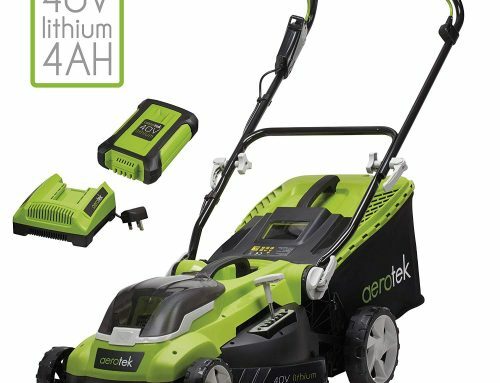 Given that this Yard Force 46cm Cordless Rotary Lawnmower is designed to handle gardens, up to 1000sqm, it makes sense that they have incorporated a generous 55-liter hybrid grass collection bag. This will make your work faster with less time needed to empty the bag. The grass bag features an indicator to advise you when it is full and needs to be emptied. I will get into some of the other options shortly but a good size bag in itself is a great time saver. 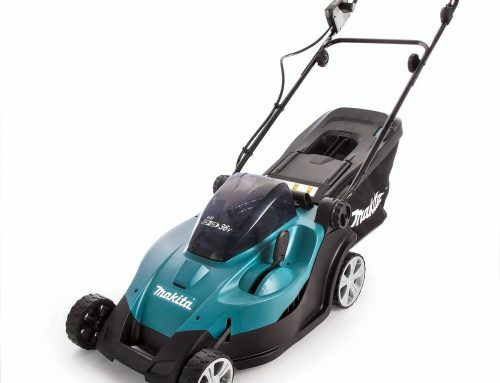 This Yard Force 46cm Cordless Rotary Lawnmower is a premium lawn mower and it is all about practicality. The fact that is self-propelled makes it a pleasure to operate. It is heavier than the average model so it will take a bit of time to get to grips with manoeuvring around tight bends or curves but that will soon become easy. The 4-in-1 Decking Central Height Adjustment is an amazing feature. What this means is that you have multiple options and it is super easy to switch from one to the other. Given that it is self-propelled you will need minimal effort to guide around your lawn. This feature gives a few speed options to suit your own needs and the conditions. It copes well with banks and slopes. The power and cutting diameter will further reduce the effort required to mow your lawn. It also allows you greater control. The handles are soft grip and ergonomically designed for maximum comfort while operating. The lawn mower starts with minimal effort and requires minimal maintenance. The grass collector bag is also extremely practical and easy to remove or fit on. 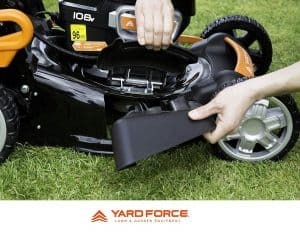 Another great practical feature of this Yard Force 46cm Cordless Rotary Lawnmower is that, despite the weight and size, it is really easy to store when not in use. Yard Force call this the “Mow & Stow” feature. 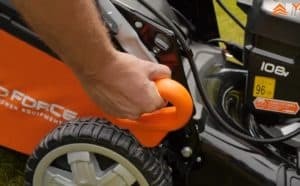 The handles fold down and you can store the mower vertically. The steel deck also makes this machine more practical. It is solid and durable. This makes it better suited to tougher conditions. Despite the impressive power of this machine, it will run for around 55 minutes and only takes about 40 minutes to charge. Again, this is superior to the majority of cordless lawn mowers. Yard Force has ensured that this lawn mower has all the necessary safety features. It has a safety key to ensure it cannot be started accidentally. Another great thing is that the instructions clearly state all the necessary safety precautions one should take. Yet another outstanding feature of the lawn mower is the 4-in-1 cutting modes. This gives you the freedom to bag the cut grass or mulch. It has a rear or side discharge depending on your needs or preference. On a cordless lawn mower, such options are pretty rare so this really makes this model stand out. Mulching is extremely beneficial for your lawn and will return Nitrogen and other nutrients. This enriches the soil and gives the grass many benefits. The end result is a happier and healthier lawn. It will reduce the need for fertilizer while making the lawn less thirsty. You do not need to mulch every time you mow and you cannot do it when the grass is very long but it is a great option to have. Again, this feature is fairly rare on cordless lawn mowers. Cordless lawn mowers are generally suited only for those with tame and small to medium sized lawns. 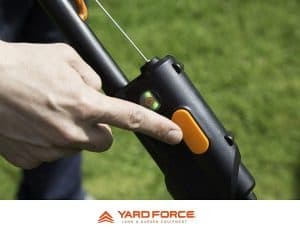 This Yard Force model shows that you can still enjoy the freedom of no cables or petrol while sill efficiently and effectively mowing a lawn up to 1000sqm. Through the use of advanced technology and a great design, this model will prove to be a pleasure to use. It is durable and has a great warranty and easily cope with even the toughest conditions. 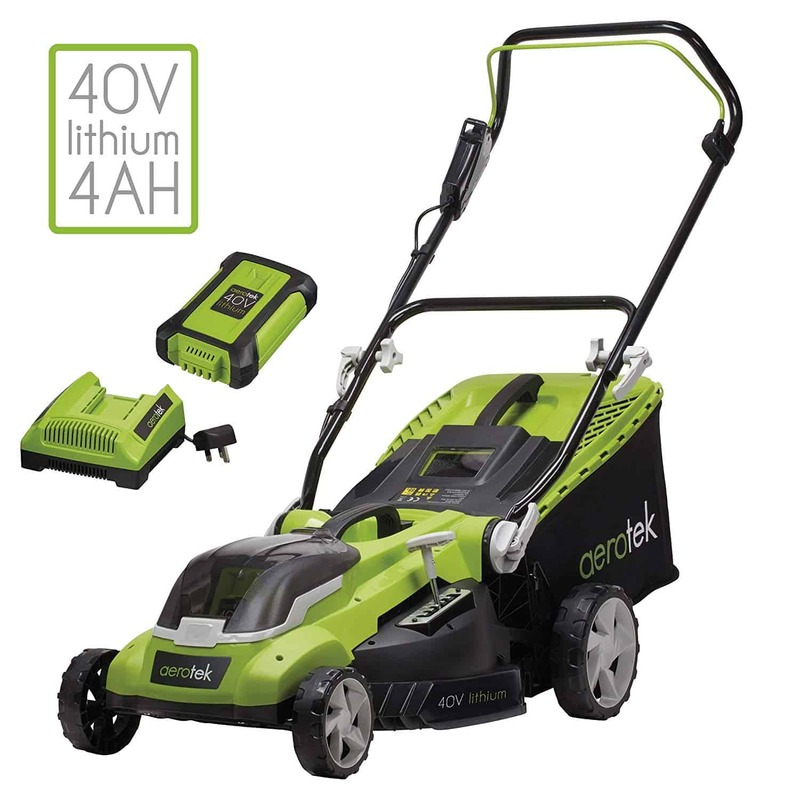 If you want the freedom of a cordless lawn mower without compromising on power than this is a great option. It can handle lawns of up to 1000sqm and will tackle even the toughest grass types and conditions as well as operating well on steep banks.